Please use this order form to put in an order for film stock. Submitting the form should generate an automatic invoice which will have our bank details on it. Please put the invoice number as a reference when you make the payment. A note about negative films: negative films are only suitable for transfer not projection. The advantage of negative film is exposure latitude! Vision 3 50d colour NEGATIVE. The finest grained of the colour negative films. This is now our current standard film stock option. Colour negative films are only suitable for transfer not projection. Vision 3 200t colour NEGATIVE. Much grainier than the 50d. Good for general indoor filming. Colour negative films are only suitable for transfer not projection. Vision 3 500t colour NEGATIVE. Much grainier than the 200t. Good for low light filming. Colour negative films are only suitable for transfer not projection. Tri-X Black and White 200 asa. Good for general black and white filming and for filming in lower light. Somewhat grainy. Note: nanolab now only process this stock as a NEGATIVE. This gives greater exposure latitude and faster processing turn around. If you need this film processed as a positive for traditional film projection, please contact Hanna Chetwin at AFW in Melbourne: hannachetwin@gmail.com. 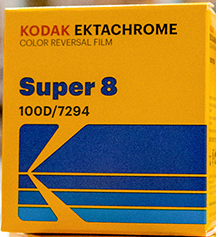 A long time in the making, this is the new Ektachrome from Kodak! It is a beautiful colour reversal film! However we can only recommend this film if you know the light meter in your camera is working correctly. With colour reversal, correct exposure is critical. Do not shoot more than one roll of this untill you have seen the results of your first roll. This beautiful stock is currently the only colour super 8 film suitable for projection. Sadly, it is expensive..